Despite not entirely succeeding in television properties this year – both Iron Fist and Inhumans have been very poorly received by critics and fans – Marvel Studios has continued thus far to provide some solid new entries into the Marvel Cinematic Universe, with Guardians of the Galaxy Vol 2 and Spider-Man: Homecoming both being hugely enjoyable in their own respective ways, and now the same can be said for Thor: Ragnarok, which reinvents the God of Thunder’s own franchise in about the same way that Iron Man 3 took Tony Stark’s series in a whole new direction, and certainly provides just as fun (as well as funny) results. Chris Hemsworth returns to his signature role as Thor is introduced here after being captured during his long intergalactic hunt for Infinity Stones (well, it wouldn’t be a Marvel movie if they weren’t setting up next year’s Infinity War somehow), but some deep monologuing on his captor’s part helps him easily escape and return to his home on Asgard, where he finds that his adoptive brother Loki (Tom Hiddleston) has taken over in the guise of their father Odin (Anthony Hopkins). After a brief hunt on Earth – and a run-in with a previously-established future Avenger – they eventually find him, only for him to reveal that their long-lost sister, the Goddess of Death Hela (Cate Blanchett), is about to return and assume rule over Asgard. After easily handicapping Thor by destroying his trusty hammer Mjolnir, both brothers are soon thrusted onto the trash planet Sakaar, where Thor is forced by eccentric dictator The Grandmaster (Jeff Goldblum, at his Jeff Goldblum-iest) to participate in a gladiatorial match against a deadly opponent – who just happens to be a very familiar angry green monster (a “friend from work,” as Thor puts it). Soon, the race is on for Thor to somehow find his way off this planet and get back to Asgard before Hela can impose her rule on its people, but nobody said it would be easy. 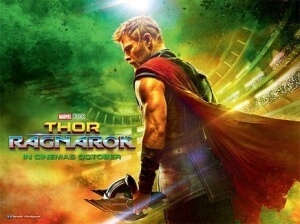 When you step back to take a look at it, Thor: Ragnarok follows the standard formula for a major superhero three-quel – the hero is stripped from his primary resources, and forced onto a journey to regain what was taken from him, whilst encountering some strong character-developing moments along the way. It worked for Iron Man 3, and it sure as hell works for Thor, too; though he is a popular Avenger, his own line of movies haven’t exactly stood out amongst the many others, probably because they feature the least-interesting characters, stories, villains etc. But for his third solo outing, it seems that they just decided to throw away any pretence that this is meant to be taken seriously with a bit of humour here and there, and just put the sense of humour right at its centre with all the serious bits mostly shoved to the sidelines. The hiring of director Taika Waititi, known more for quirky and often hilarious comedies like What We Do In The Shadows and Hunt For The Wilderpeople, certainly helps the humour of this film stand out more, and while this film doesn’t raise nearly as many belly-laughs as either of those films, it still manages to get a serious laugh or two because of Waititi’s ability to mine some great comedic timing from his actors and sometimes even the general pacing of the film. Hemsworth is finally in a position where he can make his character truly funny, and the actor has such great comedic timing that he can make even the smallest things utterly chucklesome, from just the simplest awkward lean to delivering a line with a straight-faced but ultimately self-aware attitude. The guy has enough charm and charisma to easily carry this film, and he shares some fun chemistry with many of the actors he shares a screen with, including Hiddleston who gets plenty more to do as Loki this time round, and Mark Ruffalo who, as both Bruce Banner and the Hulk, is a perfect combination of the straight man and comic foil respectively. Newer characters such as Tessa Thompson’s hard-drinking former Asgardian Valkyrie, Jeff Goldblum who again is at his Jeff Goldblum-iest here, and even Waititi himself as a CGI rock monster with the soft voice of a Polynesian bouncer, all get their fair share of awesome moments, as well as a great amount of the film’s biggest laughs. It’s often very funny and definitely remains fun all throughout, though it’s not without its weaknesses which at this point for a Marvel film are pretty standard; once again, the villain isn’t very interesting (though at least Cate Blanchett seems to be enjoying herself while hamming it up), and it takes a short while for the film to really kick into high gear, but when it does it’s a pretty enjoyable time, and definitely some of the most fun a Thor movie has even provided. Even those weaknesses are ones you can chalk down to just typical Marvel movie faults, though let’s hope they clear up that villain problem by the time Thanos shows up next year, and they don’t really get in the way of this movie’s primary goal of making you laugh and enjoy yourself while doing it. Thor: Ragnarok is a highly enjoyable superhero comedy that takes the popular Marvel character to new comedic heights and mostly succeeds, though it does suffer from a few of the usual MCU pitfalls we’ve come to expect from a Marvel film.